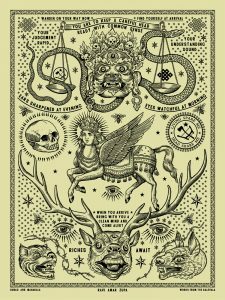 Continuing his exploration of spiritual and mythical characters from cultures across the world, Ravi Zupa has released the third print in his Tattoo series featuring Buraq from the Islamic tradition and a buddhist version of Mahakala. At the top, we see Mahakala—a fierce, chaotic form of Shiva (husband of Kali) who plays a significant role in Tibetan Buddhism. Like his wife, he is a symbol of time and thus is bound by no rules or structures of morality comprehensible by the human mind. “Facing Mahakala is the most alarming and frightening event in the life of any consciousness,” Zupa says of the mythological character. “But,” he adds, “it is important to remember that he is not our enemy.” Directly below Mahakala is Buraq, inspired by Indian and Persian depictions of him. “He is the brilliant, beautiful being that carried a number of prophets to Heaven in the Islamic tradition. The text from this print is pulled from the Finnish epic poem “The Kalevala” (as was the text from the last two pieces in this series). In this section, a character receives instructions on how to conduct himself when he embarks on his first spiritual journey. Zupa explains, “These instructions are also very basic, good advice for all of us when in the scary, disorienting, psychological spaces that we occasionally find ourselves.” The 18” x 24” poster is available as a one- or two-color version. Zupa has also released five totally unique variants. All are available on his website until sold out. This series was launched with the “Gratitude” print, available as a gift only to those who wear tattoos of Zupa’s work and the artists who create their tattoos. The second in the series (a closed edition of 50, now sold out) featured Medusa and Rangda. See and read about both on Zupa’s website. Entirely self-taught, Zupa looks to works by German Renaissance printmakers, Flemish primitives, abstract expressionists, Japanese woodblock artists, and Mughal painters for inspiration. 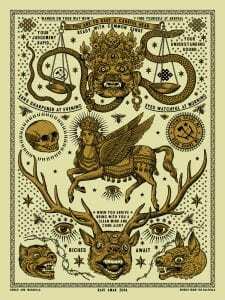 He also frequently incorporates religious iconography from Europe, Asia, and Pre-Columbian Latin America with revolutionary propaganda from around the world.